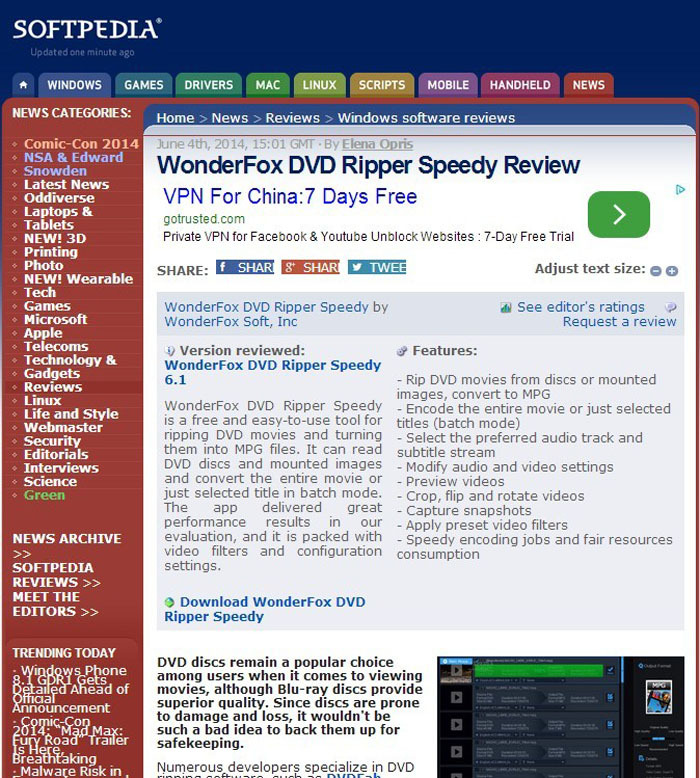 In June, after the evaluation by SOFTPEDIA editors, review on their site with great length, was objective in assessing the performances of WonderFox DVD Ripper Speedy. 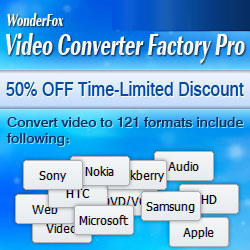 “The app delivered great performance results in our evaluation, and it is packed with video filters and configuration settings”; “Even with its minor setbacks, WonderFox DVD Ripper Speedy is a great tool for ripping DVD movies and converting them to MPG files for backup purposes, living up to its name when it comes to speed”-extracted from the source page. If you’re a software lover, the site is no stranger to you. Softpedia is a "popular destination for software downloads”-a library of over 1,000,000 free and free-to-try software programs for Windows, Unix/Linux, Mac, Mobile Phones, Games and Drivers. It was the first site that scanned its listed software for viruses and malware, which built adequate safeguards into the security of the software downloads. Thanks for the comment in the affirmative on WonderFox DVD Ripper Speedy, which makes this free software come to be known by increasing folks. SoftPedia readers were very enthusiastic in our WonderFox DVD Ripper Speedy, so we decide to organize a time-limited giveaway campaign for WonderFox DVD Ripper Pro to express our appreciation. We hope we can share it with people who really need it to solve their plights. WonderFox DVD Ripper Pro is the super enhanced version of DVD Ripper Speedy possessing much more functionality, more flexibility, and more power, based on particular analyze of requirement of DVD ripping collection. 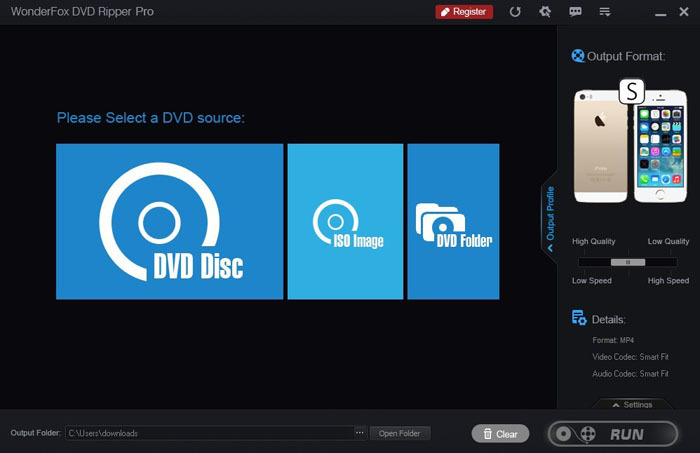 It mainly manifest in the aspect that DVD Ripper Pro enables to rip commercial DVD discs and convert them into any popular formats including MPG (DVD Ripper Speedy supports only)and much more, as well as multimedia devices like iPhone, iPad series, Android device, TV, PSP, etc. From August 1st through 7th, a salvo of new giveaway is to be launched to some fanfare. At the appointed time, every SOFTPEDIA subscriber can apply to get the free DVD code of WonderFox DVD Ripper Pro, with the latest edition. WonderFox Soft has collaborated regularly with SOFTPEDIA, the world's finest download site on software giveaway. We are both interested in expanding this co-operation to give users something of value and positive user experience. So please join in the SOFTPEDIA giveaway, get a free DVD ripper. Should you have any questions in WonderFox DVD Ripper Pro giveaway, or want to get some professional support on DVD ripping? Please do not hesitate to Email Us.